While most people have a dominant learning style, nobody has just one learning style. Everyone uses each of the learning styles to some degree. Some are stronger in one style while others have even strength in all styles. The reality is that we all have a custom “learning style” that is, in varying degrees, a combination of Visual, Auditory and Kinesthetic learning. It is useful to know the strength of your learning styles as they relate to each other. This allows you to focus on maximizing your learning potential. Recognizing your strengths also helps you to seek learning opportunities that cater to your combination of learning style strengths. In recent years, many educators have started using knowledge of learning styles (and multiple intelligences) to improve teaching methods in order to reach learners of all types. A summary of each of the VAK learning styles is provided below. 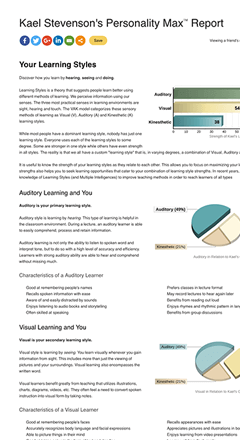 Take the Learning Styles Test to what your strongest learning style is. The Visual learning style is learning by seeing. You learn visually whenever you gain information from sight. Auditory style is learning by hearing. Learners with strong auditory ability are able to hear and comprehend without missing much. Kinesthetic style is learning by doing. You learn in this manner whenever you capture new information through physical activity. You may also be interested in learning about Multiple Intelligences. Discover your Learning Styles. See your personalized results complete with charts in just a few minutes.